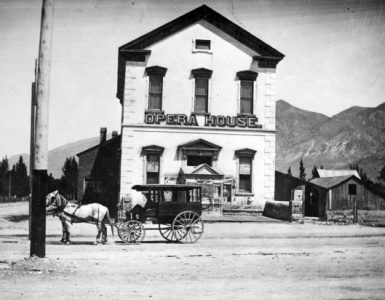 As the twentieth century came into its own, Brigham City officials saw the need to have their own office and council space, improved quarters for the fire department, and their own jail. Although the idea of a city hall had been broached on-and-off for a few years, there were no concrete plans or agreement on its location. 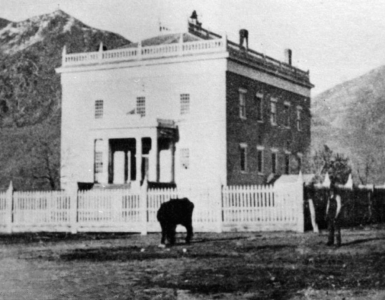 The latter was brought to the attention of local residents with a Box Elder News article entitled “Let us Protest,” simply signed “Citizen” in the March 7, 1907, edition: “The matter I refer to is that of acquiring property on First South for the purpose of erecting a city hall, etc.” and goes on to point out that this is an area where most of the city fathers are located, and could possibly benefit from its purchase. On the contrary the city owns land in the very heart of our business district, immediately north of our County Court House and that property stands there a disgrace to the this fair city. It corners on the cross roads of our two principal streets, Main and Forest, and though to us who have grown up to see it as it is continuously, it is no more than a constant reminder that our officials are not doing their duty by their neglecting it. It is an eyesore to strangers who come of Forest Street and behold the mutilated fence and unfinished premises. Just try to see in your mind’s eye, city fathers, that piece of ground parked“Parked” refers to being planted as a park. as in the Court House grounds, and in the midst of it all a beautiful hall and fire department.1Box Elder News, “Let us Protest,” March 7, 1907, 1. A reply to “Citizen” from City Council member Andrew Funk appeared in the next issue, noting that city finances did not “and will not for some time, be in condition to meet the expense of building a creditable [sic] city hall,” and that no official move had been made to purchase any property. Funk continued that the community would “be better served by changing that part of Forest Street, located north of the court house [sic] into an attractive street with parked walks on each side.”2Box Elder News, “Reply to Citizen,” March 14, 1907. The unpaved city-owned “neglected” property north of the courthouse was referred to alternately as Rees Square or Market Square, the latter being its official title on city maps. The men who circulated the petition argued in favor of “the site where the library now stands” and their reasons included the fact that: “The city owns one acre of ground and has the chance to secure at least 48-1/2 feet, which is ample for all purposes.” Proponents added that if the city was not able to build immediately, the area “can be made to look presentable” adding that “a two or two and one-half rod street could be nicely laid out” and the area “enclosed as a park as the county has done.”4Box Elder News, “City Hall site,” May 30, 1907. The Main and Forest site was not a surety, even with the possibility of expanding its boundaries. There was also the suggestion that the Minnie Snow property at Forest and First West where there was a building (Lorenzo and Minnie Snow’s large former home, “Minnie’s Palace”) ready for use. A headline in the Box Elder News of June 6, 1907, tells what happened: “Decides that city has enough real estate” and the article went on to say that the proposition to buy J. F. Hanson’s property was decided in the negative. The idea was “that the square north of the County Court House is large enough for city hall purposes and that the same be improved and beautified as fast as the city is able.”Box Elder News, “Decides that city has enough real estate,” June 6, 1907. That wording sealed the Main and Forest location, although the exact placement of the building was not decided until later. General discussion continued within the city council. In March, 1908, published minutes state that “the matter of a building suitable or a city hall, jail and fire station was referred to the committee on finance.”Ibid, Minutes of City Council: March 26, 1908. In February, 1909, the mayor appointed a special committee consisting of Wynn L. Eddy, John P. Christensen, and John H. Horsley to “secure plans and estimates of a suitable city hall, and to find if the necessary funds can be raised for this purpose.”5City Council Minutes, February 4, 1909. It is interesting to note that the focus of the building changed from city hall to fire station in future references to its construction and dedication, perhaps because the main floor would be occupied by the fire department and the upstairs would be city hall. Fire department equipment was still housed in an 1897 wooden building. The department owned the equipment but voted in 1901 to turn it over to the city, making the city responsible for its housing and upkeep. Chief interest centers in the Firemen’s building, which will also contain rooms or the city officials. The plans are proposed by Architect A. Funk as follows: Basement containing store rooms for electrical and water works supplies, under the main floor. In the east end will be built a cement room for the accommodation of tramps and other undesirable citizens who wish to lodge with the city. At the north east end of the basement will be the hose tower which will rise to a height of 70 feet. In the top of the tower will be a belfry. The ground floor will be given over to the firemen for truck stalls, excepting a corner of the south east end, where a jail cell will be put in. This cell will not connect in any way with the “hobo” apartments underneath but will be used for the more respectable “drunks etc.” The stairway leads up from the main entrance on the west end and the upstairs will be divided into five rooms, viz: a large assembly room for city council and the public, two city offices, firemen’s library and the lavatories. The building will be constructed of reinforced cement and pressed brick, with a Spanish metal tile roof, in all to cost approximately $7,000. The site has not yet been decided upon.”6Box Elder News, “Building Activities,” April 22, 1909. In connection with the building of the Fire Station, the parking of the square was considered and as decided by the Council it is proposed to make the street just north of the Court House grounds, 3 rods wide including an 8 foot walk on each side giving the roadway a passage of 2 rods clear . . .
Then it is proposed to open an alley on the north side between Joseph F. Hansen’s property and where the library now stands, 2 rods wide, running through the block – in line with the one running back of First National Bank Building . . . It is proposed to build the station on the north west corner 10 feet back from the west sidewalk and ten feet back from the north alley, with cement approaches of course.7Box Elder News, “The New Fire Station,” May 13, 1909. This was the location of the MIA Library, and it was left to the library officers to decide where to put the library, with the city council noting they would “gladly make room” on the adjacent city property. This was quickly decided, and the newspapers soon reported that the library would be “pulled back on the square to about the center of the block and turned to face north, making the entrance from the street that will be opened along that side.”8Box Elder News, “Library on the move,” August 15, 1909. Construction was soon underway, followed closely by both local newspapers, and by December 30, 1909, it was announced that the “finishing touches” were being put on the building and that a “housewarming” event was being planned in the Opera House dance hall.9Box Elder News, “Finishing Touches,” December 30, 1909. This “pleasing and brilliant affair” was held in early March. Moving fire equipment and city offices took place over the next few months, and “general rejoicing” was announced in June, 1910, in that the “city offices have been removed to their new home in the fire station.” They were described as having four rooms, a spacious hall, and a toilet.10Box Elder News, “In New Quarters,” June 9, 1910. A finishing touch was moving the fire bell to the city hall belfry, through arrangements with John H. Bott. Improvements continued along the block, with the cement sidewalk running the length of the block from Main to First East Street installed in 1911.11Box Elder News, July 17, 1911. By this time, mechanization had taken over the streets. The Box Elder Journal of November 27, 1913, notes the arrival of a new fire truck with the ability to speed along to a fire at 20 miles per hour. By 1917 the department requested another motorized truck, but World War I bought other concerns, including many of its members called into service. 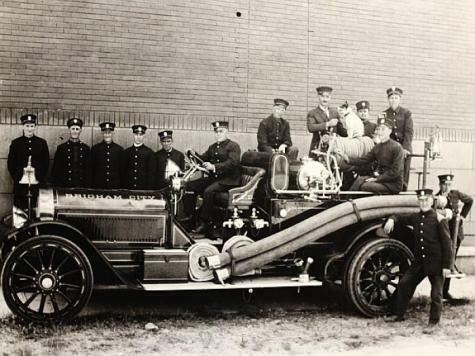 Firemen were excited over the arrival of a gleaming 15-foot American LaFrance in 1919. It had a 125 horsepower straight-eight engine that would go up to 65 miles per hour. The department added first aid equipment for fire rescue, including an “inhaler,” in 1927.12Sarah Yates, “Brigham Fire Department Marks 100 Years Service,” Box Elder News, Brigham City, UT, November 19, 1978, 8. With so much equipment, by 1934 the Fire Department had outgrown its quarters. In 1935 the city purchased the Glover property at 42 W. Forest, a 40 x 224 foot building erected originally as a livery stable in 1905 and housing Owen Auto Service, and also acquired adjoining corner property where the Opera House had been located. The Glover building was to be remodeled and equipped to house the fire department. At the same time, the Main Street building would have a new front entrance and city offices expanded from upstairs into a remodeled downstairs.13Sarah Yates, “Brigham Fire Department Marks 100 Years Service,” Box Elder News, Brigham City, UT, November 19, 1978, 8. This article was based primarily on Fire Department minutes.In June, 1935, it was reported that the firefighters would be “moved from city hall to the new quarters within a few days” and reported it was a “spacious new building, purchased recently by the city, which would provide ample room” and remodeled to accommodate the fire trucks and equipment. It had been decided that the signal bell would remain in the City Hall tower.14Box Elder News, “New Building to House Fire Fighters,” June 7, 1935.The newly equipped station included two front entrances, automatic doors, and plenty of floor space for new equipment. This soon included a new American LaFrance engine, which arrived in May 1938. It cost $8,500 and boasted a 12-cylinder 190 horsepower engine, capable of pouring 500 gallons of water per minute, and was equipped with a 200-gallon booster tank for immediate use.15Yates, 8.By September 1935, the remodeling of City Hall was nearly finished, with a new front of red pressed brick, black rodded joints, and the rest of the tower painted to match the main entrance. Doors and windows were surrounded with ornamental white granite. Office space was more than doubled, the vault enlarged, restrooms improved, a large oak counter with its front covered with imitation tiled green leather was in the main floor office. 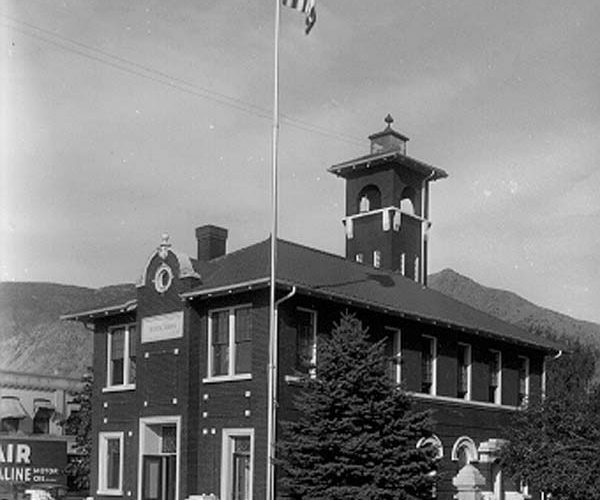 The council chamber and rooms were moved to the second floor, and a 60-foot steel flagpole had been erected.16Box Elder News, “Remodeling of City Hall Nears Finish,” September 6, 1935.Citizens were invited to visit the city buildings in October 1935, with tours offered of the city hall, fire station, and even the jail “made attractive” in this flurry of building, with that facility to be shown by Chief of Police John M. Burt. Several dignitaries spoke, the high school band played, and citizens had an opportunity to see the improvements.17Box Elder News, “Citizens Visit City Buildings,” October 15, 1935. The October 19, 1935, Box Elder News featured photographs of the new and old City Hall.The Fire Department continued to upgrade equipment. Several problems had been encountered with the 1938 engine during the World War II years, but new equipment was not available. Even after the war ended, there was a two-year wait, but a new Mack truck finally arrived in 1949.18Yates, 8.There was also the question of ambulance service. 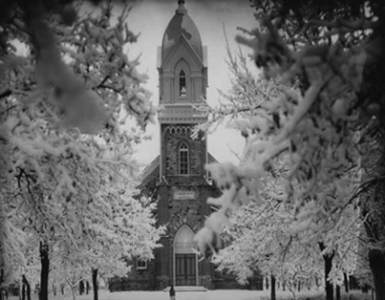 In August 1947, the city firefighters battled a fire that destroyed the old Central School located on Main Street across from the tabernacle. Up until this time, local undertaker Harold Felt had provided ambulance service, although the firemen were trained and had first aid equipment to use on calls. Felt approached the department and suggested that they take over ambulance service in 1947, rather than using a hearse. The city had no money allotted to purchase an ambulance. Felt presented the city with a vehicle in 1950, opening a new phase in services.19Yates, 8.